This page is for the 2013 reboot. For the original, see Tomb Raider (1996). PC port features high resolution textures, tessellation, high quality shadows and more PC-specific features. Official Forums - not PC-specific. The GOTY Edition does not include the Survival Edition non-game extras. The GOTY Edition does not include the following DLC: Agility Skill, Animal Instinct, Headshot Reticule, Pistol Burst, Pistol Silencer. These upgrades can be unlocked during gameplay without buying the DLC. Japanese language support is only available in Japan and requires a separate purchase or the Japan Tomb Raider GOTY Edition. Download the TR2013 Yamatai Patch. Run the game or the patch first. Turn on the No Cam Wobble feature. 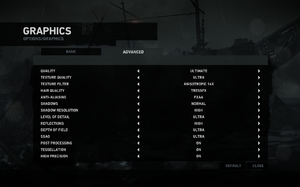 Most graphics settings in the registry corresponds with .ini options for benchmark. Aspect ratios other than 16:9 are squished. All HUD elements are correctly drawn on the center screen. Some in-game cutscenes display odd animations or missing models in areas that aren't visible in 16:9. FXAA and up to 4x SSAA. Changing the default FOV breaks zooming with weapons and the relic viewer. Download and install Cheat Engine (make sure to choose "Custom Installation" BOTH times, and uncheck all boxes). 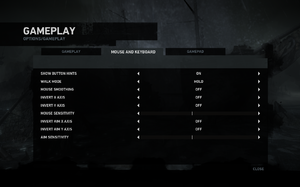 Download the Tomb Raider (2013) FOV Cheat Table. 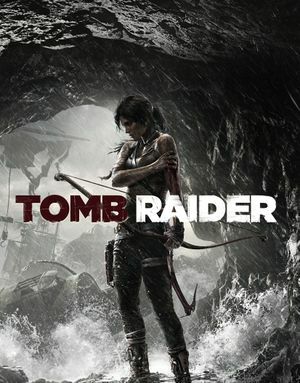 Run Tomb Raider, then Alt+Tab ↹ from the game. Double-click TombRaider.CT. This should open an instance of Cheat Engine. In the Cheat Engine window, click the top left button with the computer icon. Select the TombRaider.exe process and click Open. Click Yes to the confirmation dialog, and switch back to the game. 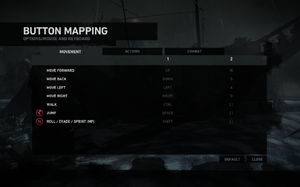 Press F2 to toggle the fix, and NumPad +/NumPad - to increase/decrease the FOV. If you're using a keyboard without a number pad, you can use the On-Screen Keyboard. Prompts between keyboard and controller change on fly. XInput and DirectInput. Priorities XInput. Bindings are stored in the configuration file location but are complex to edit. 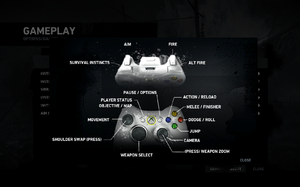 Use the TombRaider Dualshock3 Mod. Requires Japanese Language Pack DLC. Windows only. Multiplayer is not cross-platform between Windows and OS X/Linux. Vertical and horizontal sensitivity do not match, with vertical being much lower, making it hard to aim with a mouse and keyboard. There are several performance demanding options that can be lowered/disabled without providing a noticeable graphic loss. 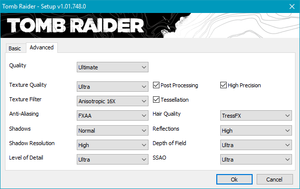 Disabling TressFX technology by setting hair to normal. TressFX has major impact on frame rate, especially on non-AMD GPUs. Setting Screen space ambient occlusion (SSAO) to normal. "Ultra" Ambient Occlusion setting stands for HDAO, AMD's AO technology, and may cause major performance loss in NVidia videocards. 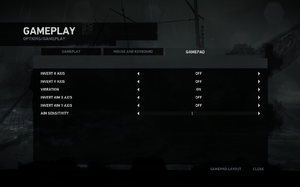 Setting AA to FXAA is recommended as it provides barely no performance loss, while SSAA is very demanding. Setting shadows option under Ultra. Running game in DirectX 9 mode. Set Vsync option to Off on Advanced settings of the Launcher. Disable any "RAM optimizer" or "Game Booster" programs you may have (generally get rid of the bloatware running). Go to Sound & Audio > Audio Tab > Advanced > Performance. Change high precision to any other value. Apply changes. This fix must be applied each time the issue appears. The option can be set to its previous value again without re-triggering the bug. This tweak reportedly wields higher framerate in seemingly CPU-heavy areas like the Shantytown hub through better core utilisation. Name the new value MultiCoreFlushMode then double click on it and change the value data to 1. In the Linux version, this option is already automatically applied. Forcing DirectX 9 on Windows may result in better performance. However, DirectX 11 specific features (tessellation, TressFX) will be disabled. These steps are not for OS X or Linux (the game will not work correctly). Modify RenderAPI value to 9. Revert to 0 for DX11, anything else will result in DX11 renderer with some DX11 features disabled. Based on ingame benchmark with DirectX 11 features (tessellation, TressFX) disabled for both renderers. In some cases, a reduction in performance may even occur. Benchmark your own system before dedicating to a renderer. Tested on Intel Core i7 with HD6870 GPU, average of five measurements for each renderer. Many quick time events (QTEs) do not display the key required to complete them. However, if you are actively using an Xbox 360 controller or other XInput-compatible controller, the game will display controller button names and colors as normal. Hand in red circle Repeatedly press interact key (default E) as fast as possible. Exclamation mark in red diamond. Press melee key (default F). White circle getting smaller Tap repeatedly melee key (default F). This QTE is bugged - circle animation is out of sync with trigger behind QTE and therefore it is difficult win this QTE normally. Luckily there is no penalization for missing said trigger with key press so pressing melee key for whole duration of QTE works perfectly. Left and right arrow Alternately press left and right movement keys (default A and D). Hand in red circle when Lara is hanging from ledge Press interact key (default E). You can replace key mashing QTE for just one key press, however you need gaming mouse or keyboard software with ability to create macros. This guide contains only general directions. Actual process may vary as there are several versions of gaming software. 1. Open you macro/gaming software and create new macro. 3. Set this macro to the desired key and set option to "repeat macro as long as pressed". If your macro is not working properly, try increasing delay as some systems won't recognize key presses if they are too fast. Right click on game in Library. Click Set Launch Options and add parameter (see command line arguments). Right click shortcut and select Properties. At Target line add parameter at the end of the string (see command line arguments). When running from the command line, exclusive fullscreen is automatically switched on and vsync is switched off. When running as a looping demo, a result file is not generated. -benchmark Run the benchmark on startup and quit the game when finished. -benchmarkini “filename.ini” Run the benchmark on startup and quit the game when finished. The ini file contains overrides for quality settings. -loop Loop the benchmark instead of quitting after it completes. 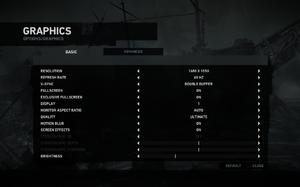 This is a demo mode, so statistics are disabled. -dxdiag Include dxdiag information in the benchmarkresults file. QualityLevel 0 to 4 Sets all settings to a quality level. 0 for Low, 4 for Ultimate. Fullscreen 0 or 1 Enables or disables fullscreen. ExclusiveFullscreen 0 or 1 Enable this when fullscreen is enabled for better performance but worse multitasking. AspectRatio Width / height x 10000 or 0 Sets aspect ratio. 16000 for 16:10 for example. VSyncMode 0 - 2 Options for vertical synchronization. 0 for Off, 1 for Double Buffer and 2 for Triple Buffer. FullscreenWidth number Width of resolution in pixels. FullscreenHeight number Height of resolution in pixels. FullscreenRefreshRate number Screen refresh rate in Hz. StereoEnabled 0 or 1 Enables or disables stereoscopic support. TextureQuality 1 to 4 Texture quality from Low to Ultra. BestTextureFilter 0 to 18 Texture filtering - 0 for No Filtering, 1 for Bilinear, 2 for Trilinear, or 2 + the Anisotropic level. HairQuality 0 or 1 Enables TressFX enhanced hair quality. 0 for Normal or 1 for TressFX. AntiAliasingMode 0 to 3 Sets anti-aliasing level. 0 for none, 1 for FXAA, 2 for 2xSSAA and 3 for 4xSSAA. ShadowMode 0 or 1 Enables or disables shadows. ShadowResolution 0 to 2 Sets shadow resolution. 1 for Off, 2 for Normal and 3 for Ultra. SSAOMode 0 to 2 Sets ambient occlusion quality. 1 for Off, 2 for Normal and 3 for Ultra. DOFQuality 0 to 3 Sets depth of field quality. 1 for Off, 2 for Normal and 3 for Ultra. ReflectionQuality 0 to 2 Sets quality of reflections. 1 for Off, 2 for Normal and 3 for High. LODBias 0 to 4 Sets level of detail bias from Low to Ultra. EnablePostProcess 0 or 1 Enables or disables post-processing effects. EnableTessellation 0 or 1 Enables or disables tessellation. 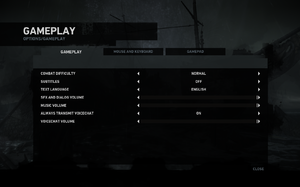 ↑ Feral Support | Tomb Raider FAQs | What is included in the Single Player DLC Pack (Mac App Store)? ↑ Official performance boost from crystal dynamics!!! Check inside!